Two brothers, William J and George Besler recently installed a reciprocating steam engine in a conventional Travelair biplane, and a number of successful flights have been made at the Oakland, CA airport. The power plant is illustrated in these columns by photographs and a diagram. As the engine was really an old automobile engine, the airplane came out 300 lbs overweight, but it is expected that savings in weight will be readily made later. The Besler brothers’ steam engine is a two-cylinder double-acting, compound 90-degree V engine, with a cut off at about 50% of the stroke. The high-pressure cylinder has a bore of 4.25 inches and a stroke of 3 inches. The low-pressure cylinder has the same stroke, but a 5-inch bore. The ordinary working pressure is 950 psi, and the temperature of the steam is 750 degrees F. The engine not only drives the propeller but also drives a blower through an over-running clutch. The blower (an electric motor used when starting) supplies air to a Venturi in which the fuel lines terminate. The Venturi leads the mixture to a firebox, where an ignition plug sets the mixture aflame. Once ignition has been started, the process of combustion is continuous. The steam generator is of a modified flash type. The tubing is continuous in length, about 500 ft in total length; the coils are covered with metallic wool insulation and sheet aluminum. A pop valve is set to give relief at 1500 psi. A thermostatic normalizer device injects water into the superheater whenever the temperature goes over 750 degrees F. From the boiler the steam passes through a throttle to the engine proper, and then to two condensers — one mounted at the top of the fuselage and one below. From the two radiators or condensers, the steam passes into the water tank, which is provided with a steam dome. From the water tank, a pump passes the water through a primary heater and then to a secondary heater. By preheating the water, some of the energy of the exhaust stream is put back into the system, ad thus the overall efficiency is improved. After passing through the heaters the water again goes back to the boiler, and the process is repeated over and over again. A great deal of the technical work on the Besler steam engine was done at the Boeing School of Aeronautics, and we are indebted to Mr. Welwood Beall of this school for a first-hand account of the design and operation. said to have remained virtually at a standstill since its infancy, and that is in the type of engine used to furnish the motor power for aircraft. 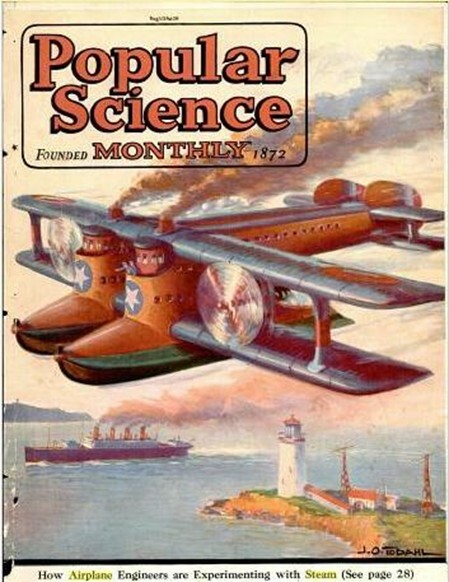 Aeronautical engineers long have recognized that the development of a motor that will combine lightness of weight with high power efficiency but that will lack the uneven performance of the present internal combustion engine probably is the principal problem confronting them in pushing the commercial possibilities of aircraft. The steam plane is constructed throughout of duralumin, the extremely light aluminum alloy which has been wed used successfully in airplane construction in this country. The engine is an adaptation of the Diesel engine, now extensively employed in the United States Navy. It burns a combination of crude oil and other oils, which is broken up under a forced air feed and sprayed against the boiler. Here it Ignites, giving terrific heat considering the relatively small quantity of oil consumed in the operation. ten gallons of oil are said to be sufficient to run the plane’s 750 horsepower engine for eight hours. American aviation engineers are inclined to question this statement, as well as the report that only 1000 pounds of water are used in a flight of 95 hours. They do agree that the principles employed in the new plane are likely to lead to important developments. The steam turbine and boiler are said to be considerably lighter than other engines capable of developing equal horsepower. It is claimed also that the new plane will carry much less weight in oil and water than the weight of gasoline carried by an ordinary airplane of the same size, equipped for a flight of equal duration. The water used to generate steam in the new plane is carried in the metal wings in compartments so arranged that the water may be shifted to “trim ship” if desired. The steam is condensed after exhaust and conveyed back to the wings in the form of water. 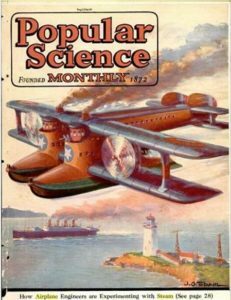 George W. Lewis, M. E., executive officer of the National Advisory Committee on Aeronautics, says that the U.S. government has done considerable experimental work on steam power for airplanes, but has met with only partial success because of the problem of condensing water without the use of heavy equipment. For the heavier-than-air machine, he believes steam power does not look encouraging at this time but ultimately will be of considerable use in propelling dirigibles. Lewis and other aeronautical engineers in the Navy agree that steam is the apex of efficiency and that its thorough reliability under practically every condition makes it a fertile field for experimentation. We have a new website. We hope you enjoy it.